has been inspired from true events, brings to fore the lesser known facts about the beautiful yet tormented valley of Kashmir. Three childhood friends, Deewan, Safeena and Bilal, have to bear the brunt of the most turbulent times that the valley has faced in a long time. Consequently, Deewan is forced to run away from his home with his family, Safeena’s mother is sacrificed and Bilal is forced to live a life full of deprivation and fear. As the place the trio knew to be a paradise, turns into a violent battleground, their friendship faces the greatest test as each individual is unwillingly forced to take sides. Then twenty years later, the three friends meet once again, although they are no longer sure about what is right and what is wrong. It now remains to be seen as to how the compassion and injustice they have faced over the years will change their lives? 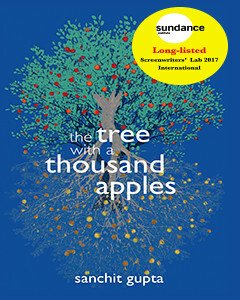 The Tree with a Thousand Apples is an intriguing and haunting tale that combines facts with elements of fiction to create a powerful story. I would even go on to say that it is one of the best works of fiction written about Kashmir that highlights the importance of friendship to help individuals overcome even the most difficult challenges in life. It also highlights the innocence of children and the feelings of love, atonement, revenge and sacrifice that develop amongst individuals as they are unwillingly caught in circumstances of conflict. Personally, I found the book quite moving and an excellent read and I wish Sanchit all the best for its success.